CLEAR Broadcast Cloud: The sought after Promo Operations Module launched at NAB this year, now has a host of new features. These include a Promo Versioning Automation add on module with enhanced templates, which gives users the additional flexibility to position any number of ‘Layer Groups’, including combinations of voice overs, multiple audio languages, text and graphics appearing on the final promo version. Additionally, the module now offers end-to-end media logistics and work order administration, along with a simpler mechanism to import promo schedules. PFT’s Promo Operations Module has already successfully delivered 20,000 promos in 2 months for one of India’s leading broadcasters, with PoC (Proof of Concept) for five top US broadcasters underway. CLEAR Cloud MAM: CLEAR has always been Open and Interoperable. Cloud MAM’s product integration portfolio has now been expanded to include over 40 products, including Atempo, Selenio, Digital Rapids, Manzanita (MP4/ TS Multiplexer), SmartJog, Datacast XD, Kaltura, AVS (Accenture Video Solution), QuickPlay, Adobe Autitude, CatchBlue and WHATS’On. Additionally, the module now provides better streaming capabilities across formats like HLS and MPEGDASH, along with support filters for auto suggest, which will facilitate Google-like suggestions. To aid better content discovery, Cloud MAM offers a new segment-wise search feature in ‘Album View’, along with extensible HMM capabilities in its library, which allow users to organize and search for metadata hierarchically. The module’s UX has also been refreshed for better experience across platforms and devices. Perhaps the most path-breaking of all new additions to this module is a brand new functionality called ‘Story Teller on Air’, which is a specialized appliance that helps create compelling stories from MAM/archive for playout on air directly. The appliance has SDI ports for both preview and output capabilities. With the help of Story Teller, 21st Century Fox-owned Hotstar created over 120 videos every day as part of their RIO 2016 Olympics event coverage. CLEAR Operations Cloud: CLEAR Operations Cloud now offers an all new scalable Dynamic Ad Insertion (DAI) feature that embeds SCTE-35 markers for a non-scripted live stream providing new monetization opportunities through personalized delivery. Additionally, its pre-configured delivery destinations have grown to over 450 in number, and now also offers the facility of native publish to a host of new destinations like Amazon Prime, Facebook, Verizon and Spotify. DAX® Production Cloud: One of the key upgrades to DAX® Production Cloud is the addition of a special ‘My Projects’ executive home page for executive view ers to have a streamlined one-click access to their most important content in a strong new, easy to access UI. The module now also has the ability to ingest, conform and deliver raw camera footage to proxies and various downstream formats. 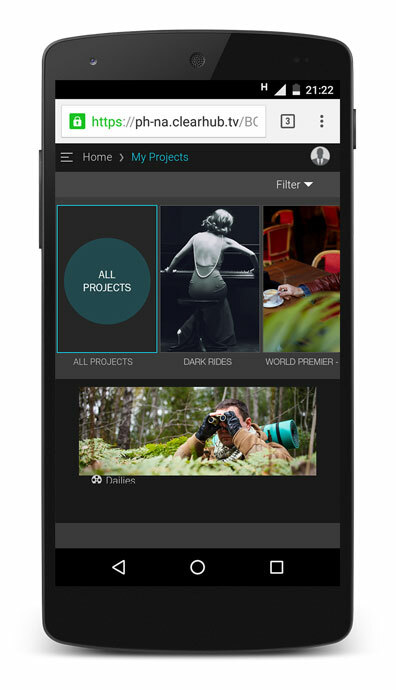 Additionally, it also sports enhanced Editorial/VFX/Graphics workflows with BPM functionality to facilitate the distribution of raw files to Editorial/ VFX teams. It has now also become available on Android along with Desktop Apps for Windows and Mac, Browsers, iOS (iPad and iPhone) and Set Top Boxes. CLEAR is fast becoming the product of choice for Broadcasters and Studios across the globe. In the last quarter, CLEAR has been adopted by Hearst Television, Viacom’s OTT platform Voot, Warner Bros., EPIX, Global Eagle Entertainment and Cricket Australia. “Empowering our customers to better manage changing consumer demands efficiently through latest technologies is our prime focus”, said Ramki Sankaranarayanan, Founder and CEO, Prime Focus Technologies. “Whilst continuing to help companies virtualize the content supply chain, PFT is committed to addressing specific customer challenges at department level, with cutting-edge technology innovation. Our slew of industry-first product upgrades at IBC is a testimony to that.” The stage seems set for PFT’s sixth successful run at IBC! PFT will be at Hall 7, Booth #B12, showing customers new ways to drive creative enablement, enhance efficiencies, reduce costs and boost monetization. Broadcast Cloud - Automated workflows from Acquisition to Distribution using ONE software: Broadcast Cloud enables workflow orchestration across the enterprise, supply chain and partner ecosystems. It provides a single software on the cloud for all departments and is a one-stop-shop to manage, review, process and publish content across all the platforms and devices of the broadcast universe. Cloud MAM - ONE MAM for the Enterprise across geographies, departments & businesses: Cloud MAM is a single, holistic Media Asset Management (MAM) solution, which enables M&E companies to build a truly connected enterprise with digital workflows. Its Hybrid Cloud architecture gives content owners peace of mind that their content is secure with them while the applications run on the cloud. Operations Cloud - Multi-platform content delivery with presets: Operations Cloud helps content enterprises not just store and transcode, but perform end-to-end content operations on the cloud. It is ready-to-deploy with a wide range of preset robots (TVE, customer portal, Netflix, YT, DPP) that allow users to enjoy faster time to market at lowest costs. All this with pre-defined SLAs and timely counsel. DAX® Production Cloud - Automated workflows for Dailies and Post using ONE software: DAX® Production Cloud allows users to deploy the same system for both dailies and post servicing workflows. This means, stakeholders across the production supply chain – On-set, Editorial, VFX (pull downs), Marketing (trailers), Localization Vendors, Distribution (screeners) – all collaborate on the same software.